Note: in 2006, Rep. McGhee won his district by 56.4% of vote and in 2008 increased that to 56.6% of vote. In Cass County in 2006, McGhee won by 384 votes; in 2008 he won by 839. In Johnson County in 2006, McGhee won by 562 votes; in 2008 by 910. 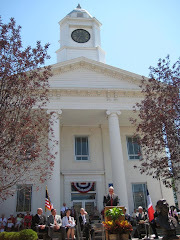 In Lafayette County in 2006, McGhee won by 863 votes; in 2008 by 694. Ike Skelton (DEM) for 4th U.S. Congressional won 74% to Jeff Parnell’s (REP) 25%. Jay Nixon (DEM) for Governor won 55% to Kenny Hulshof’s (REP) 42%. Peter Kinder (REP) for Lt. Gov. won 52% to Sam Page’s (DEM) 44%. Robin Carnahan (DEM) for SOS won 60% to Mitch Hubbard’s (REP) 36%. Mike Gibbons (REP) for Att. Gen. won 51% to Chris Koster’s (DEM) 48%. Brad Lager (REP) for Treasurer won 51% to Clint Zweifel’s (DEM) 45%. Joe Aull (DEM) for State Rep. 26th was unopposed winning 98% with 58 Write-in. Brian Pratt (REP) for State Rep. 55th won 54% to Mike O’Donnell’s (DEM) 41%. Stanley Cox (REP) for State Rep. 118th won 76% to Stan Bowlin’s (DEM) 23%. Gil Rector for Northern Commissioner, Mike Dobson for Assessor, & Dale Ensor for Treasurer, all were unopposed and running as Dems. 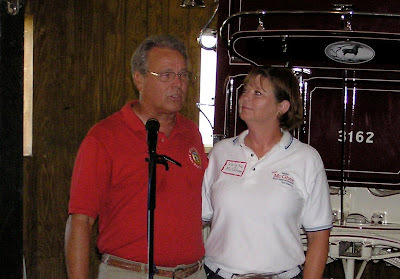 at October barbecue at the home of Glen and Lisa Kolkmeyer, Deerview Farm. Last night on the final day of the RNC Convention, Senator John McCain warned Washington insiders, "And let me offer an advance warning to the old, big spending, do nothing, me first, country second Washington crowd: change is coming." "We need to change the way government does almost everything: from the way we protect our security to the way we compete in the world economy; from the way we respond to disasters to the way we fuel our transportation network; from the way we train our workers to the way we educate our children. All these functions of government were designed before the rise of the global economy, the information technology revolution and the end of the Cold War. We have to catch up to history, and we have to change the way we do business in Washington. Again and again, I’ve worked with members of both parties to fix problems that need to be fixed. That’s how I will govern as President. I will reach out my hand to anyone to help me get this country moving again. I have that record and the scars to prove it. Senator Obama does not." Deafening applause ensued, so much so that at times it was difficult for us to hear, especially the last few words of his speech. The stage was changed earlier in the morning because McCain prefers to stand as close to the audience as possible. I attended a McCain town hall meeting at Union Station in Kansas City this summer and saw that first hand. McCain loves to look the audience in the eye and talk directly to them. He did the same last night. And as is his custom, after his speech he walked down the steps with his wife Cindy onto the arena floor. He visited with delegates, shook hands, and thanked the lucky ones seated near the stage for their service to this country. John McCain in his purest form--thanking others first. Day 4 was more serious and subdued than the Palin debut on Day 3 because McCain wanted to emphasize a message that was solemn and thought-provoking. Once his work was done and done well I might add, the crowd became celebratory singing and dancing to the new song by John Rich, "Raising McCain." We’re all just raisin’ McCain!" --Yes, we saw the Code Pink protester, but honestly there were two of them who crashed the convention the night before so it rattled no one. One man yelled quite a bit from an upper deck but did not appear to be violent. Incidentally, I was speaking with someone who thought all Code Pink gals were young, but let me tell you these gals were not. This left me pondering what they do for a day job and have they been protesting for years like this?. Could this be their day job? Just wondering. For the record, Code Pink calls on women around the world to rise up and oppose the war in Iraq and future wars. Encourages all actions, from public education and free speech to loud and often outrageous protest. They were not popular with this crowd. --Calls and text messages from home ask me who is the man who looks exactly like Abe Lincoln. He is on television and in newspapers and on the web. Who is that guy they ask me, almost daily. Well, I am happy to report that this man who calls himself an "Abe Lincoln admirer" not impersonator but admirer (and I like that description), is a Missouri Delegate. He is George Engelbach of Hillsboro, Missouri, our very own Abe Lincoln. And a fine gentleman he is. The rest of us in the delegation want to stand next to him so we can get in the newspapers, too. At the very least, we want our photo taken with him and most of us have. --Michael Steele who spoke to our delegation the day before, walked past our Missouri delegation and visited again with us graciously allowing photo ops. Speaking of photos, nearly every celebrity or politician we met pleasantly agreed to photos and seemed to enjoy visiting with the audience. --The list of the famous folks we saw is just too long to list here, but a standout on that list in my book is Henry Kissinger who was seated in the VIP box very close to the Missouri alternate delegate seating. --Speaking of the VIP box, the Missouri delegation's alternates were seated stage right and behind the VIP seating. Many of us preferred sitting there to the main floor. We saw a steady stream of diginitaries and celebrities in those seats, and we had a better view. --If you are wondering as some have asked, "Why are people constantly walking around on the convention floor. It looks like people are moving all the time." And indeed, yes we are. Most state delegations continually switch between delegates and alternates on the floor. We exchange our credentials for the swap. This practice allows everyone who is in the delegation to experience the floor setting. Then, if possible guests of delegates and alternates who are seated in the rafters are allowed to go down to the floor for a few minutes but must come right back to their seats. When most of the states are doing this it makes for constant movement on the floor. No one minds knowing that it is an opportunity all should enjoy. Great plan even if it makes for crowded aisles and constant floor traffic. --Earlier in the day, Sen. Kit Bond and his wife Linda, one of the convention coordinators, hosted a luncheon for the Missouri delegation at The Loring Pasta Bar in Dinkytown near the University of Minnesota. It was an ecclectic, funky place with fabulous food and atmosphere. Definitely a highlight of the week. 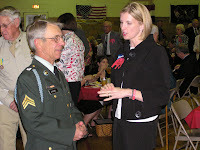 Senator Bond's special guests at his luncheon were representatives of Missouri Task Force #1 based in Boone County, MO. Nearly 80 Missourians from across the state were moved to St. Paul as a precautionary measure. Doug Westhoff, task force leader, explained that MO Task Force #1 is a federal Urban Search and Rescue Resource in the Department of Homeland Security. They set up camp headquarters just outside the city, ready to respond if needed. Senator Bond explained, "We understand protesters and that is fine with us. They have every right to protest, but when they start breaking windows of businesses, starting fires, and attacking police and firefighters, that is criminal! That is why we brought in Missouri Task Force One." As it turned out we were very glad they were there, too. When we left the restaurant, we encountered students from the University of Minnesota who were rude albeit peaceful. Their comments usually went something like this: "Go away. We don't want your kind here." Missouri Task Force One stood outside the restaurant as a deterrent. Most of us decided not to go shopping or browsing because of the unwelcome reception we received in Dinkytown. Earlier we had been told to guard or hide our credentials because dissidents were stealing them. No doubt how the Code Pink gals got in the arena later in the day. In the local newspapers, we read stories about how the businesses throughout the St. Paul area were not happy with the protesters who blocked customers from their stores. In most cases, local residents as well as visitors decided not to venture out beyond the protected "Red Zone" where there was protection. Not good for business needless to say, and we are sorry for the locals in that regard. None of this is their fault, and we would have visited their shops and restaurants if we could. Quote #1--Fred Thompson who spoke to us at a reception for Senator Bob Dole. Thompson said this, "This is not the time to turn the keys to the car over to an inexperienced driver in heavy traffic." He was referring of course to Obama. At this particular reception on Day 3 in honor of Senator Dole, Missouri and Kansas delegations came together to honor Dole's service. To my surprise, there were minimal MU-KU jokes. For this cause, we were all on the same page. Former Senator Jack Danforth, former Senator Jim Talent, candidate for Governor Kenny Hulshof, former Senator Fred Thompson, Senator Sam Brownbeck, and other notables made remarks. Quote #2--Senator Kit Bond quipped about Sarah Palin, "She is going to body check Joe Biden!" Quote #3--Senator Bond said at his luncheon on Day 4 that he gave the wrong analogy earlier when he called Palin's speech "a home run." He said I misspoke. I should have said it was a hat trick because she pulled from her hat three very important things. She can speak. She showed us her life exemplifies what she believes in. She took out her stiletto heel and punctured holes in the Barrack balloon!" Most of us are heading home this morning full of memories, unexpected experiences, and renewed hope for the future of our country. This blog is what I like to call "responsible opinion." Blogs are rightly about opinion, but bloggers must be responsible in that task. I try to do just that. From Minnesota enroute to Missourah, warm regards from the Missouri RNC Delegation. P.S. We love Minnesota, where we learned the real meaning of "Minnesota nice." Former Senator Jack Danforth said it best this morning at the Missouri Delegation breakfast when he quipped, "Since the surprise announcement last Friday of McCain's VP pick Sarah Palin, she became an instant target. But guess what folks, this target shoots back!" And shoot back she did last night at the Xcel Center with an energizing speech like nothing most of us in this delegation have ever heard. Palin took on her critics in the media and from the left with true grit and fire. A quick look at the faces in the room told me all I needed to know--something big is up. Something is changing. We are in the midst of a happening. If you saw Palin's speech on television and I imagine most did, then you saw the faces, too. Radiant faces, wide grins, unmistakable excitement. I will go one further and say those faces expressed pure "astonishment" as well. Yes, the crowd was astonished. We could not believe that anyone would have the guts to say what most of us there wish we could say and don't. But Sarah did, and she did it with the kind of poise and moxy we can only envy. This woman is fearless. We saw it with our own eyes. Who among us would have the courage to do what she did last night as she walked onto the world stage under unimaginable pressure. Not many. And a side note--last night, Kenny Hulshof gave the announcement from the Show Me State that the great state of Missouri proudly cast all its 58 votes for John McCain! We are leaving now for a full day of activities so more details of last night will have to wait for the next blog. Your Missouri State Delegation sends its warm regards to all fellow Missourians back home. Day 2 continued and what a day it was! The Missouri Delegation is getting used to political, media and hollywood stars if one can get used to such things. We wave to Bill O'Reilley and Carl Rove all the time, and they generously smile and wave back from their booth just above us. Those in the Missouri alternate-delegate section sit behind the VIP section with such notables as Jon Voigt, Cindy McCain and family, and Bush 41 and Barbara. We are surrounded by famous folks everywhere we go it seems, and believe me, we are throughly enjoying every minute of the experience. Outside the arena, each evening we walk by a MSNBC live broadcast with "one whose name cannot be mentioned" and where his small audience gawks and points at us. First, just for the record, despite what you may read or see in the media, the police here took mere minutes to subdue the violent protesters and keep them away from delegates. These particular protesters are the "anarchists" who have been saving their urine to throw at us. Yes, you heard that correctly! The peaceful protesters, on the other hand, are complaining because the media is not covering them as thoroughly as they believe they deserve. I will leave that for you to judge. Personally, I think the peaceful folks have a point. Please do not get me wrong, our experience is not just about seeing and meeting famous folks, as pleasant as that is. No, it is rather about the "meat and potatoes" of this convention, an historic one at that. So as Paul Harvey is fond of saying, here is "the rest of the story". As I mentioned in the earlier blog about Day 2, we heard an amazing array of powerful speakers at our luncheon. Below I offer a brief recap of each of those speakers' remarks before I continue with the rest of the day's events. Senator Kit Bond--kudos to our senior senator from Missouri who brought these fine speakers to us. 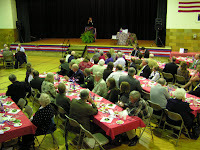 First, Senator Bond recapped the recent event in O'Fallon, Missouri, honoring Senator McCain and Governor Palin. He talked about how the 22,000 Missourians rocked the house that day. The only downside of the event for Kit was the fact that he had to follow U.S. Rep. Kenny Hulshof who is a candidate for governor. The senator said that anyone who has heard Kenny speak knows he is a tough act to follow. The senator added that all you have to do is hear Kenny once and you are sold. Senator Bond then introduced an array of stellar speakers. Roberta McCain, 96, and mother of Senator John McCain. Without a hitch in her voice, no cane and no assistance from anyone, she came to the podium and gave an inspirational speech about her son. By the way, she also spoke some about the Nelson Art Gallery in Kansas City saying it is one of the best galleries in the world. And, we Missourians thank her for those kind words. Col. Roger Dolan and Col.Bud Day, both war heroes in their own right. Col. Day, incidentally, served time with Senator McCain in the "Hanoi Hilton". John McCain was shot down in Vietnam on August 26, 1967, and just two months later Bud was shot down on October 26, 1967. Col. Day recalled how John McCain refused to be released early. Day recalled that McCain said, "Not until everyone who has been here longer or who is sicker is released first." Day said "no one was sicker or was injured worse than John McCain." Michael Steele, former Lt. Gov. of Maryland and television commentator. Michael Steele is an amazing speaker, smart and savvy. For the life of me, I cannot understand how the citizens of Maryland rejected such an outstanding leader for the U.S. Senate. His only mistake, as was noted at our luncheon by Sen. Bond, was that he happened to run in the wrong year--2006. Steele gave a talk centering on the idea of reform and explained how the GOP was the original party of reformers responsible for putting an end to slavery, and said the GOP was the party that pushed the passage of the Civil Rights Act. Cream rises to the top, as the saying goes, and that applies in the case to Michael Steele. We will be seeing more of him! John Bolton, former ambassador to the United Nations. I do not have the space to repeat the insightful and informative facts Bolton presented. Suffice to say, that the number one thing Bolton says that separates the ability of individuals to lead is whether or not they possess "the energy of an executive." Without that, they will be weak leaders. Bolton described the qualities of both McCain and Palin in terms of that concept. In both cases, they make immediate and correct decisions quickly without the need for committees, focus groups, advisors or philosophical thought processes. The essence of "energy of an executive!" Rudy Guiliani, former mayor of New York City often dubbed "America's Mayor". Rudy attended the DNC convention in Denver and took away with him the stark realization that no words were mentioned about "islamic terrorists" and the threat they present. Few words were said at the DNC about Sept. 11. He described the Democratic Candidate for president (BHO) as one who has an unrealistic and naive understanding of the threats that America faces. He contrasted Obama's response to Russia invading Georgia with McCain's saying it took Obama 3 days of changing his message on what he would do to McCain's immediate statement that "We are all Georgians!" Before and after lunch we were treated to visits to two different railroad operations. In the words of Sam R., an alternate/ delegate from Moberly, "Burlington Northern Santa Fe, Peabody Coal, Norfolk Southern and Union Pacific opened historic passenger cars at rail sidings in St.Paul to the Missourians. Those visits were highlighted by the nostalgia of standing on observation cars used by former Presidents Harry Truman and Dwight Eisenhower. " Appetizers were served, and that was dinner, because soon after, we were bussed to the convention for the evening session. The gavel closed the session, but the most difficult part of the convention was still ahead for us. Perhaps, we will do better on Day 3. Enjoy the show. We continue to be amazed at the workings of the political process of this great country. Every U.S. citizen should count their lucky stars, we think, for having the opportunity to live here, to differ, to agree. In this convention, delegates cannot comprehend the "hate America first" crowd. We are glad we are not among them. See you after Day 3 with more convention stories, the biggest of which will be the speech by Gov. Sarah Palin. Missouri Delegation begins Day 2 of the RNC Convention in Minneapolis! After a star-studded array of speakers at our luncheon today (Day 2 of the convention), your Show Me State Missouri delegation is clearly aware that our state is center stage and pivotal to the upcoming election. Not only are we seated immediately to the right and next to the stage at the convention, but we will also be one of five states nominating Senator McCain. Missouri's history of correctly picking presidential campaigns is lost on no one here. For example, at our state delegation luncheon today, we heard from one famous speaker after another. Since our hotel is located so far from St. Paul, I guess we were somewhat surprised when they found us since we have trouble finding the hotel ourselves. Just kidding. But I digress. It was clear something was up as secret service agents appeared through side doors to the dining hall. As each speaker finished, a side door opened and in walked yet another famous face, one after another. Later today, I hope to paraphrase some of these speakers' remarks if time allows. For now, just know that we were treated to the following speakers at lunchtime: Roberta McCain, mother of Sen. John McCain, John Bolton, former ambassador to the U.N., Michael Steele, former Lt. Governor of MD and television personality; Col. Bud Day who was shot down 2 months prior to John McCain and spent years with him in the "Hanoi Hilton"; and Rudy Guiliani and his wife Judith. Numerous Missouri elected officials and politicians were also on hand. Each speaker graciously visited with our delegation and posed for photos. This was only lunch. Who knows what the rest of the day will bring. Stay tuned. As we begin Day 2 of the RNC Convention, take a minute and look at an inspiring video about Sarah Palin, our vice presidential candidate. On the right side of this page, scroll down to OUR LINKS, and click on America's Future--Sarah Palin. Day 2 events will be posted later, much later in this busy, busy day. My first blog this morning was about our breakfast meeting, the RNC response to the Gulf Coast states in their time of need due to Hurricane Gustov, and about plans for the rest of the day. See that blog below this one, the second blog of the day. After our morning state delegation meeting, we boarded buses about 11 AM for the W Hotel in Downtown Minneapolis where we were treated to a delightful luncheon sponsored by Target. The food and hospitality were once again stellar! Speakers included U.S. Senator Kit Bond, U.S. Representative Roy Blunt, and Governor Matt Blunt. Just a grand time. From there we were transported by bus to the Xcel Convention Center. Things appeared to be going normally until we neared the exit ramp in St. Paul. There we saw the ramp closed and police cars and officers scattered around the ramp entrance. On the ramp were protesters who were lying down on the ramp to block busses of delegates attending the convention. The law enforcement guys had everything well in hand, and we took a detour. We did not see protesters again until we boarded the buses for the trip back to the hotel. Our first clue that things might not be quite right was when a police officer boarded our bus and rode with us to our hotel. We noticed earlier in the day that there were blocks and blocks of tall black portable fencing separating the protesters from the delegates and the convention center. When we left we were glad the fences were there. The buses exited through the corridor between the fences. Along the way we saw swat teams in full riot gear, portable jails, and police officers everywhere. Apparently, protesters who called themselves "anarchists" broke windows and set fires and tried to disrupt the convention while we were inside. They were not successful. Thank goodness for the planning and execution of the security measures needed for this convention. We were very happy to return to the hotel safely, only to find more police cars waiting there. The security folks were taking no chances and we are grateful once more. We do not know what tomorrow will bring, but of course we are hoping to get back to the business of nominating the next president of the United States. Today we enjoyed speeches by First Lady Laura Bush and Cindy McCain. Both these lovely ladies spoke about Hurricane Relief programs already in place. Go to www.CauseGreater.com to learn more about these efforts. Delegates are donating, packing relief boxes, and conducting fund raising for the Gulf States. And as we continue tomorrow, we keep the residents of the Gulf Coast states in our thoughts and prayers. Wish us all well as we go about the solemn business at hand for our country. Good night from True North country. Talk to you tomorrow. The Missouri Delegation began the first official day of the convention early with a breakfast with Gov. Matt Blunt at our hotel. The Governor gave a rousing speech about the stark differences facing American voters as they choose between the McCain/Palin ticket and the Obama/Biden ticket. Obama is the most liberal member of the U.S. Senate and Biden the third most liberal, the Governor said. Both have voting records more left-wing than the one avowed Socialist in the U.S. Senate. So, there you go. For Missourians, the choice is clear-McCain/Palin!!! Gov. Blunt also highlighted the recent big Missouri McCain/Palin rally in O'Fallon that attracted 22,000 plus supporters. The rest of the breakfast meeting centered on the support and volunteer effort Missourians are giving to Gulf Coast residents. Missouri's National Guard is in place already to provide military police support. Other volunteers are there to help with disaster assistance. First Lady Laura Bush will address the opening session of the convention this afternoon and introduce the governors of the gulf states and discuss efforts there to help their citizens. We have lunch today with U.S. Senator Kit Bond, Governor Matt Blunt, and U.S. Rep. Roy Blunt in downtown Minneapolis and then off to the Xcel Center in St. Paul to conduct the necessary business so we as a party can indeed nominate our candidates. Talk to you more tonight. Keep watching this site and send the link to your friends and families so they, too, can hear first hand about this historic convention. God bless the folks along the coast, our volunteers, our leaders. Everyone at the RNC sends our thoughts and prayers and blessings their way. Hi from RNC Convention -Aug. 31, 2008 from Minneapolis! Hello from Minneapolis and the Republican National Convention! Pardon me and all the other delegation from the great State of Missouri as we gush over the warm and kind hospitality shown by the good people of Minnesota and especially by the twin cities of of Minneapolis and St. Paul as we arrived for the first event of the convention. Tonight we were treated to a Delegation Welcome Reception at the Minneapolis Convention Center. We were met by what seemed like legions of volunteers in yellow polo shirts who stuck out their hands and greeted us, smiled, and gave us needed directions. Across the street, we heard and saw some anti-war protestors who tried to be loud but really weren't. They were kept successfully away from us, but nevertheless I zoomed my camera lens in for a photo . This is no small thing, this Minnesota hospitality. I do not know anyone who was not more than a little impressed with the amazing reception they gave. More about that in just a minute so bear with me while I digress. Let us start at the beginning of the day so you won't miss a single thing. We arrived at our host hotel located in some city north of Minneapolis and I am not sure many of us could say where. We drove and drove and more than one thanked their lucky stars and GPS that brought them surely and safely here. I had to look this up on the hotel letterhead in my room to see where we actually are, and apparently we are staying at a town named Brooklyn Park. All we know is that it is north, very far north of the city. Our delegation has agreed that as far as accomodations are concerned, well we are just not going to talk much about ours. Instead, we are focusing on the fact that the RNC is giving the State of Missouri prime convention seating. We are one of 5 states that will have the honor of placing Senator McCain's name in nomination and Missouri is seated front row and center at the convention (stage right). We have no idea if hotel selection was a lottery system and we drew the shortest straw . Whatever the reason, we are not complaining and are delighted to have prime seating at the convention beginning tomorrow. Speaking of tomorrow, the session has been abbreviated due to the impending hurricane that is threatening the entire Gulf area. Our Missouri delegation meeting this afternoon began with a prayer for the residents of the states involved. That was followed by a live video stream from Senator John McCain who expressed his opinion, and ours, that we are Americans first. This goes hand-in-hand with his philosophy of Country First. McCain said we are not Republicans first, we are Americans first and that is why we are all so willing to help our countrymen in any way we can. The RNC is providing emergency transportation at no charge for those who need to go back to Mississippi and other locations to check on relatives or property. All programs and speakers have been cancelled for Monday. The convention will convene officially at 2:30 PM on Monday so that official business can be handled. As all of us who work in local politics, know there are dates scheduled for these things that must be honored, especially if set by statute. After McCain addressed us by video, we got to see a live streaming video of the McCain/Palin rally at O'Fallon, MO. There were 22,000 plus folks there to greet them! Missouri gave the McCain campaign a huge welcome! 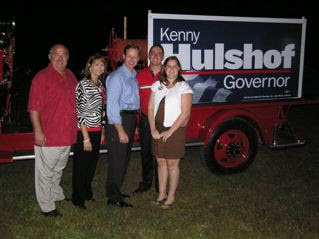 Kenny Hulshof (for Governor), Gov. Matt Blunt, and Senator Kit Bond spoke before McCain and Palin took the stage. The crowd was electric with excitement. Yes, I did promise to tell you more about the reception tonight at the Convention Center, so back to that. Food, food, food would describe it well. Delightful and delectable appetizers and entrees were served by chefs and their assistants. We could choose from about any food one could possibly think of including local specialties such as Walleye and Swedish pastries. Some of the expo attractions included: walking through a replica of AIr Force One, a display of china from a variety of White House presidents, shadow box displays of various campaigns, displays about past presidents, a huge showing of American flag art, a replica of Ronald Reagan's presidential limosine, and my favorite--lifesize replicas of First Lady's wearing their best gowns. And for those of us who came without proper Republican apparel or jewelry, we were given opportunities to remedy that problem. And almost everyone enjoyed shopping at the booths and vendors. Most of us will now be properly attired for the convention in our red, white, and blue shirts or jackets. Don't forget our hats! Watch for those, too, when you tune in to the convention. We found our buses, carefully following our instructions, and eventually made our way back to the hotel. I shudder at the thought of folks being left behind because when the guides said the buses were leaving at 8:30 they meant business. When we got back to our rooms we had a gift box from the Missouri GOP with snacks and goodies galore. Then they treated us to more food and drink including cake with strawberry cream filling. Oh my. Well I am too full and too tired like everyone else and we are calling it a day. Check back here tomorrow night for more info about this exciting event. Although subdued, it is still a necessary, worthwhile and important event for our party and our country. Good night from Minneapolis, or more precisely, somewhere True North. Blog from Republican National Convention to be posted later tonight. Keep watching! Watch for daily blogs here from the Republican National Convention! Throughout the Republican National Convention, beginning on Sunday, Aug. 31, watch here for daily blogs from delegates and/or alternates to the convention. We will try to keep you informed and give you some inside "fun info" about this exciting event! Check this blog every day. 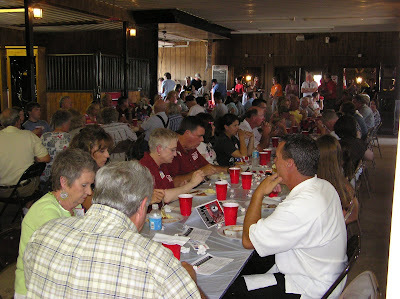 Area residents gathered Monday, July 21 for a barbecue in honor of Rep. Mike McGhee at the Rocky Ridge Clydesdale Barn north of Odessa. More than 150 area residents enjoyed a barbecue and all the trimmings as well as a variety of cakes for dessert. Buxton Barbecue of Odessa served the dinner. 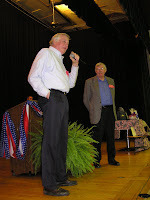 The Lafayette County Republican Central Committee hosted the event as a thank you to McGhee for his service to the surrounding area and for his help to local charitable organizations. McGhee expressed his appreciation to those present and introduced his wife Valeta and county and state officials in attendance. Kyle Forsythe, barn manager and trainer, gave a short program about the equipment and tack used at Rocky Ridge and also about the training and performance schedule of the Clydesdales. The team will perform Aug. 12 and 13 in the evenings at the Missouri State Fair, and Forsythe encouraged guests to attend and support them at the fair. 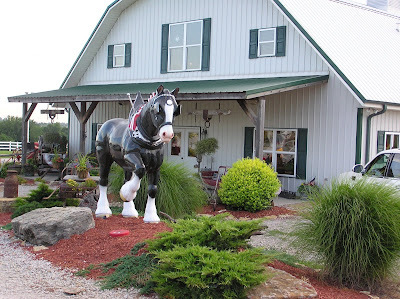 Guests were treated to a tour of the barn and a closeup look at the international award winning Rocky Ridge Clydesdale team, owned by John and Jan King of Odessa. Mootz Moody Band of Higginsville entertained with vocals and guitar during dinner. Mike and Valeta McGhee thanked the Kings for establishing “this amazing facility” and reminded the guests that the Rocky Ridge team is probably the best in the nation. McGhee remarked, “Rocky Ridge is right here in Odessa, an award-winning operation that this town, county, and state can be proud to call our own.” He encouraged the audience to tour the facilities and thanked the Kings for all they do for the area. We are now getting down to the homestretch as we wrap up the Democratic primary and begin the race to the November general election. We will be electing the next president of the United States, and almost everyone expressing an opinion, informed or uninformed, believes the Democratic candidate will be Barack Obama. I am a supporter of Hillary Clinton, but I too believe the odds of her defeating Barack Obama are overwhelmingly against her. It looks as if Senator Obama will prevail in the Democratic primary before or at the Democratic convention. His rise has been phenomenal and swift. I believe a major attraction for Democratic voters is his optimistic personality, a strong desire for change and racial reconciliation. I believe the U.S. has indeed entered its Golden Age in which discriminatory views are rapidly breaking down. The result is that there is virtually no bar to the election nationally and locally of minority candidates, whether they be black, Hispanic or Jewish, and that gender bias in the selection of candidates, whether or not Hillary prevails, has been thoroughly defeated for elections to come. So our efforts now should be devoted to nominating and electing the best candidates available, particularly for president of the United States. Anyone who knows me is aware that I am a proud American and a proud Jew who, while not religiously observant, fiercely loves and defends his faith. It has become fashionable for Americans in general, Jew and gentile, to hold President George W. Bush up to derision. As I believe many readers and listeners of my commentaries know, I crossed party lines in 2004 to support the President's reelection, saying at the time that I did not agree with him on a single domestic issue, but I did believe he was the only one running who appreciated the threat of Islamic terrorism to American values and Western civilization and was prepared to wage a war to defend those values. In the days of Yasser Arafat, leader of the Palestinian Liberation Organization and an organizer and supporter of terror, Western European countries led by France, Germany and Italy, had understandings with Islamic terrorists that if the terror was confined to acts against Israel, the European countries would allow the terrorists to function without challenge. What those European countries came to understand was that they could not buy peace by offering up Israel as a sacrificial lamb, because the ultimate goal of the supporters of Osama bin Laden, and other jihadists throughout the Islamic world, was and remains the reestablishment of the caliphate (or Islamic religious rule) in all Muslim lands, including in any nation that was once under Muslim rule, e.g., Spain. If successful, this would place one billion, 400 million Muslims under one theocracy. As part of their master plan, the jihadists intend to bring the West to its knees, and to replace moderate Arab regimes, e.g., Egypt, Jordan, Lebanon, Saudi Arabia, the Gulf states and Turkey, with Islamic republics, ultimately to become part of the reborn caliphate. For most of Osama bin Laden's career, the destruction of Israel was not a priority. However, this has now changed as the jihadists believe that Western countries have grown weary of unending war and may be convinced to offer Israel up as a sacrificial lamb. Recently, President Bush went to Israel to celebrate its 60th birthday as a nation and addressed its parliament, the Knesset. He said, "Some seem to believe that we should negotiate with the terrorists and radicals, as if some ingenious argument will persuade them they have been wrong all along. We have an obligation to call this what it is: the false comfort of appeasement, which has been repeatedly discredited by history." Bush's remarks were heavily criticized by leading Democrats, particularly Barack Obama, who said, "Now that's exactly the kind of appalling attack that's divided our country and that alienates us from the world." Really? Is it wrong to call the philosophy supporting negotiating at the highest levels - President to President without pre-conditions -- with the terrorists and radicals by its rightful name - appeasement? The President was accurate in my opinion in recalling the specter of Neville Chamberlain's pre-World War II efforts to satisfy Adolf Hitler. Those efforts responded to Hitler's siren call that all he wanted was the Sudetenland, with Chamberlain responding, "yes," and returning to Britain waving a paper and announcing, "peace in our time." Must we really learn the terrible lesson of Munich all over again seventy years later? Israel and the Western world are in great danger from a declared enemy that knows no limits when it comes to achieving its goal of destroying Western civilization and spreading militant Islam through threats and terrorism throughout the world. The danger to Israel comes not from any unwillingness of its citizens to fight. They are willing to fight the enemy, and Israel is willing to suffer the deaths of its young men and women in battle to preserve its values and its very existence. The Western world appears in many parts of Europe in particular to have lost its self confidence and willingness to stand and fight an enemy willing to continue the war until victory is achieved and their goals met. When one side loses its resolve to fight and win and the other retains its resolve, that side which has lost its courage will look for ways to appease and entice the enemy to bring the war to a conclusion. If the enemy says, understanding the weakness, "give us the Sudetenland," and later says "give us all of Czechoslovakia," as we know from history, such demands will be met. Bin Laden, recognizing the willingness of some in the Western world to give up today's Czechoslovakia - Israel - in two messages within the past few days, has emphasized his demand that Israel be delivered to the jihadists, saying, "To Western nations...this speech is to understand the core reason of the war between our civilization and your civilizations. I mean the Palestinian cause. The Palestinian cause is the major issue for my (Islamic) nation. It was an important element in fueling me from the beginning and the 19 others with a great motive to fight for those subjected to injustice and the oppressed." In fact, in most prior bin Laden threats, Palestine and Israel were rarely mentioned. Shrewdly, bin Laden, believing that with the war-weariness rising in the U.S. and Europe, and anti-Semitism escalating in Europe, there are fertile grounds to make Israel the new Czechoslovakia. The reason I believe history will redeem President George W. Bush is that he is one of the few leaders on the planet today who understands the larger picture. He has not lost his courage and vision of the future. He knows what calamities await the world if it engages in appeasement and deserts an ally in order to buy an illusory peace. We will recognize his worth long after he is gone. Ed Koch is the former Mayor of New York City.